I’ve discovered I both consciously and unconsciously use archetypes in my art. And, I’ve found that increasing my awareness of symbols and archetypes makes me more conscious of the themes and ideas that spontaneously arise in my own art making and helps me appreciate the work of other artists. It helps me get in touch with the energies within my own psyche. I see us all as composites of a variety of archetypes. Archetypes are the “generic versions of a person, and they represent the types of energies and patterns of behavior the person embodies or expresses throughout life or at a given time. One of the tools I have used to help understand mine is, “The Voyager Tarot Cards,” created by James Wanless. Tarot card decks typically contain the Major and the Minor Arcanas that represent the range of human archetypes. These types are universal and exist in all cultures and traditions. In the Voyager deck there are 10 Major Arcanas. Fool Child – Typically called “The Fool,” the fool-child represents the intuitive inspiration of genius. It symbolizes those who puts faith in the universe. The fool is able to relax and trust, to go with the flow of life. Magician – The Magician holds the tools of transformation and materialization in any area of life. This energy can also be use to help others in your world manifest their vision. It provides opportunities and solutions to problems. Priestess – The Priestess symbolizes the law of inherent wisdom, and is in touch with the subtle levels of reality, such as intuition and wisdom. This is the energy of the wise elder that is revered in all traditions—represents balance and clarity. Empress – Represents the law of preservation and is the guardian of life and of the earth. This energy is in charge of protecting the earth and honors every aspect of creation for its inherent richness and beauty. Emperor – Symbolizes the inner fire that builds and achieves professional recognition and monetary reward. Hierophant – Symbolizes the law of life-mastery. This is the energy of meditative awareness that views all of life as an opportunity for growth—Life is your teacher. Use the lessons of life as a stepping stone to the top of the temple. Lovers – Represents the union of male and female energies—the union of heart and mind, inner and outer. It represents to force of attraction between others and the embrace of opposites. Chariot – Represents changes and growth and the movement to create, achieve, and evolve. The charioteer searches for self-realization. Balance – Represents balance amidst the dance and continuum of life, between the left and right hemispheres of the mind. Balance is moving lightly with the wind like the flute to blend in with the leaves. Hermit – Symbolizes the sage who shuts out distractions to complete the spiritual pilgrimage. This energy is about the completion of wholeness and using our work in the material world as a spiritual path to achieve our life purpose. Fortune – The new physics shows us that all foretelling is never certain. Future projects are only projections. This is the energy of looking at life as opportunity and understanding our consciousness creates our reality. Artists share their personal mythology with the world. 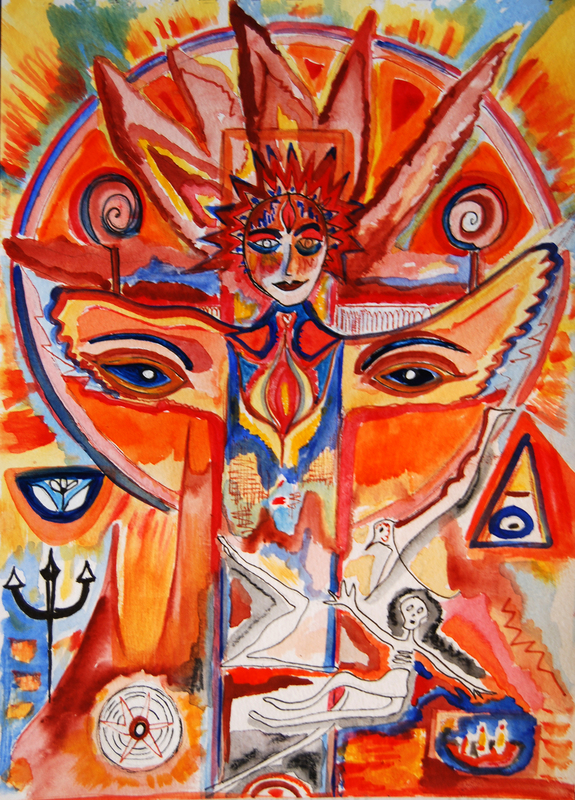 When we make art, we draw energies from the universal field of archetypes and symbols and our creations bring them back into the material world in a personal and unique from of expression. When I look at or experience the work of other artists, when I see a film, hear music, watch a play, or when I read a piece of literature, I get a view into the artists personal storehouse of symbols and archetypal energies. This enlivens that artist’s energies within me. Sharing art is a way of sharing the depths of our personal mythology and psyche with the world. Mamie – thanks soooo much! 🙂 I’ve thought about the beautiful painting of yours I last commented on, and it really inspired me…I love art that tells a woman’s story…so it means a lot to get such nice feedback from you.